It would be to yell at someone bigger than me until they give me food. I can take or leave the sleeping all day, the being generally adorable in my every moment, the knife-hands, and the resting murder-face. It’s the yelling and feeding that I want. What more could I need? Imagine being able to accost some random stranger at their home which you broke into, then you scream at them “Hey! Want! Want what you got! Give it to me!” then they reward this behavior with delicious treats. There is no human equivalent which gets the same result with absolutely no negative stigma. Sure I could beg on the street, but nobody will pet me and call me pretty if I did. And I want to be called pretty, dammit. And I can buy food, but that would totally remove the liberating aspect of delicious things being given to me for free. Why can’t I be rewarded for yelling like a monster at strangers too? In summary, I think my cat is getting fat because other people are feeding her. 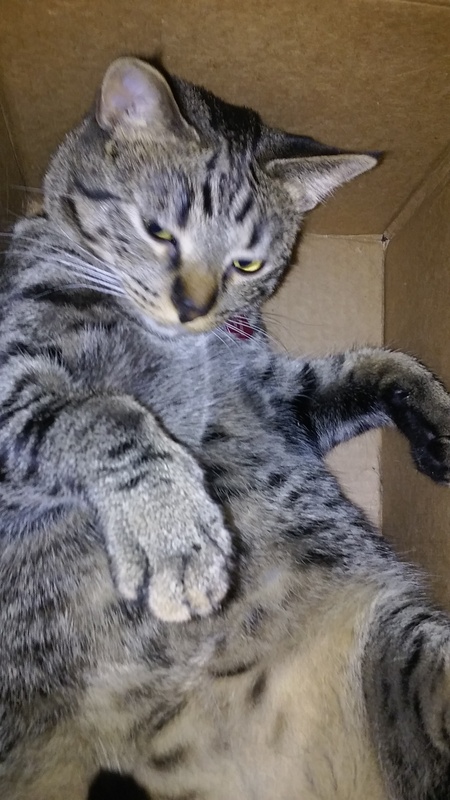 The chubby, entitled Queen of box murder. Nah, they’d just give you stuff in cans. I’d go for the Perfect Hair. It’s color stays true all your life, it never needs shaving, and it makes people want to give you full body massages on sight. I used to be so sure I knew what I was jealous of cats for. Now I can’t decide if I want a lovely mane or free food more. You have given me much to consider. Plus, there’s the boneless thing. Cats can contort into square knots and ampersands in seconds. That’s gotta be handy for house cleaning and yoga class. Ah yes, house cleaning and yoga. That’s certainly all I’d use superhuman flexibility for. I definitely wouldn’t become some sort of cat burglar who breaks into museums to steal cat-themed artifacts. One day I’ll have things as figured out as you, and on that day I’ll bask in the glory of my adequacy.